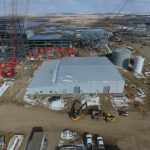 For over ten years, Hipperson Construction has supplied and erected pre-engineered building solutions for clients in the mining, bio-fuel, recreation and commercial sectors. Our company’s award winning Design/Build expertise has resulted in custom steel building designs for small office administration buildings right up to major industrial uniquely designed facilities. The ability to work with more than one supplier allows us to ensure our client receives a competitive price for their building of choice. Hipperson Construction became an Authorized Builder for Behlen Industries in 2003. 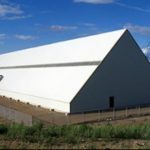 Behlen Industries is Canada’s largest manufacturer or pre-engineered steel buildings. 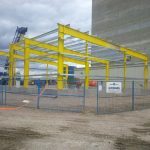 Behlen Industries is a Canadian ISO 9001 certified manufacturer in Brandon, Manitoba delivering steel building systems certified to CSA standard A660, the Canadian standard for Steel Building Systems. A product distribution relationship is also in place with Nucor Building Systems, a Nucor Company. Nucor Corporation is a Fortune 500 Company producing steel and steel products in North America. K & S Legacy Project Valve House Buildings- Supply and erection of three pre-engineered steel valve house buildings. 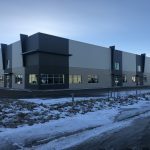 Mosaic Belle Plaine Product Storage Warehouse- Award winning design build construction of 50,000 square foot warehouse including concrete foundations. Earthworks, piling, concrete foundations and building. Whitemud Resources Metakaolin Plant- Design Build of product storage building. Contract Value $1.3 million. We subscribe to the definition of a great place to work, as defined by the Great Place to Work Institute Canada, ‘ a place where employees trust the people they work for, have pride in what they do, and enjoy the people the work with’. With hard work and pride has come some real opportunity for the staff at Hipperson Construction. The company’s continued growth has allowed for investment in more sophisticated processes, technology, individualized training, and employee benefit programs for everyone.